Granite and wrought iron outdoor table. Age to iron base from outdoor use. 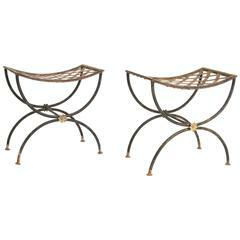 Pair of early 20th century iron garden stools. Blossom detailing on each side and base caps. Aged patina.